All over the world countries are confronted with refugees or immigrants and how to house them. 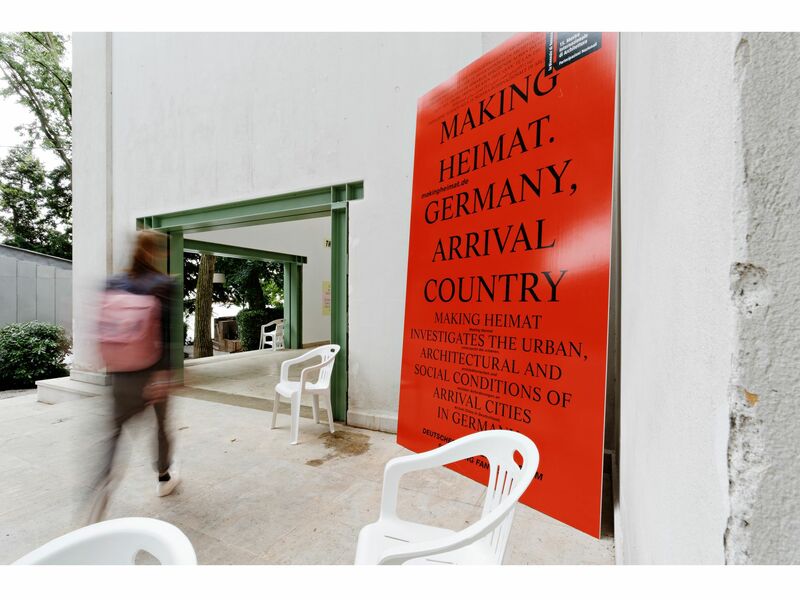 This exhibition “Making Heimat, Germany, Arrival country” was created by the Architekturmuseum for the German Pavllion at the 15th International Architecture Exhibition 2016 – La Biennale di Venezia and was stimulated by the happening in 2015 when German borders were left open for nearly one million refugees. The rearranged display is now shown in an expanded version here in Frankfurt and is initiating a discussion about the question: Is Germany an open immigration country? In close cooperation with Doug Saunders, a British-Canadian journalist and author, eight theories about “Arrival Cities” were devised. The intention is to change the mental attitude with respect to the way we view immigrant neighbourhoods. Structures for refugees have been realized or are still in the pipeline and are part of an online data base. This is demonstrated in the exhibition. Selected projects will be examined in detail by discussions, reports and photographs. The principle must be that accommodation is built that everyone can afford although this point is considered insufficient at present. Don't forget, if you have friends visiting who would like to attend the tour, just let us know beforehand and they are most welcome to come along with you. As always, we will please feel free to join us for lunch after the tour. If you RSVP and find that on the day you cannot make it you are still responsible for paying your share of the tour. Thanks in advance. The cost for our english speaking guide will be 95€ which will be split between the number of women attending (in general we have a high participation rate in the Art and Culture Group). You will also be responsible for paying the entry fee to the museum on 9€, which is reduced to 4.50€ if you have a Museum Card.